Tampa Bay is earning worldwide praise for its latest major civic undertaking: the reinvention of downtown&apos;s Julian B. Lane Riverfront Park. 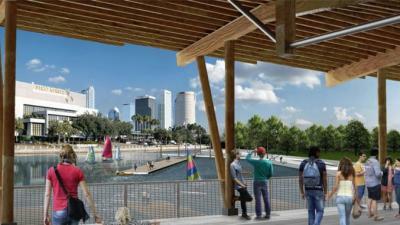 Work began July 18 on the $35 million project to redevelop the massive park on the west bank of the Hillsborough River. The park was originally developed in the 1970s but has grown outdated. 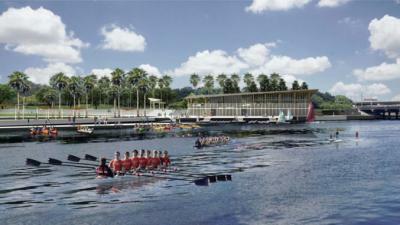 The new plans for the 23-acre park include a small harbor and public boathouse that will be a launching point for stand-up paddleboarding, kayaking and crew-style rowing on the rive -- a popular activity year-round, but particularly in December and January when dozens of northern colleges and universities come south to train over their Winter breaks. The redesign will remove several large architectural mounds and create an open plan that slopes down to the river, creating a broad public lawn and sweeping vistas of downtown&apos;s skyline and the Straz Center for the Performing Arts across the river. The reimagined park will become another great venue for public events in the same way Curtis Hixon Waterfront Park has become the city&apos;s centerpiece for festivals all year-round. The new Julian B. 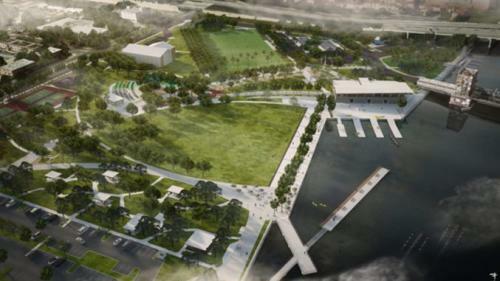 Lane Riverfront Park will also include a new riverwalk paralleling the wildly popular Tampa Riverwalk running 2.4 miles along the river&apos;s east bank. Construction is expected to finish in late 2017.